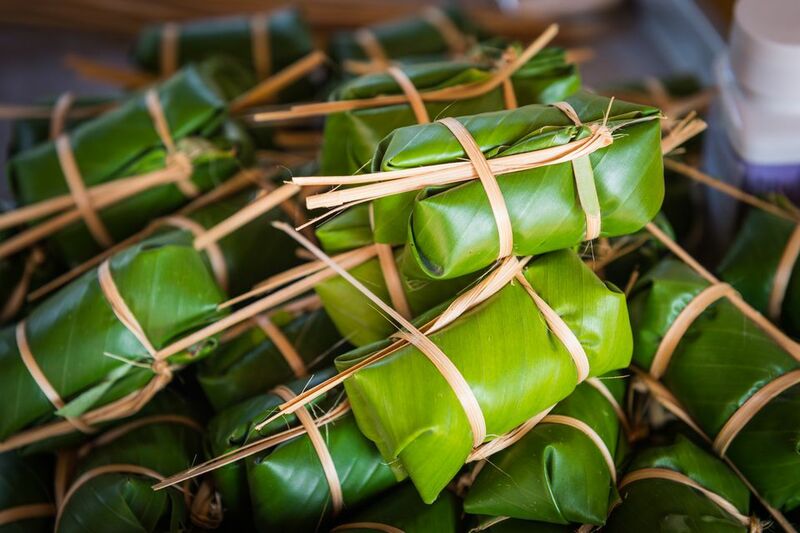 Banana leaves are used as a kind of wrap in Thai cooking (instead of tin foil). Banana leaves not only look beautiful but also lend a subtle aroma and taste when foods are cooked inside them. Banana leaves can be used for barbecuing, baking, or steaming foods. While functioning as a wrapping material, they also lend a hint of flavor to your food that is very pleasant (unlike tin foil or ​parchment paper). Banana leaf also makes a beautiful background on which to serve various Asian dishes -- excellent for party platters or finger foods. Banana leaves are inexpensive to buy -- roughly $3.00-4.00 for a large pack. Buy banana leaves fresh or frozen in large, flat plastic bags at your local Asian supermarket (check the freezer if you can't find them on the shelf or in the produce section).